People whose personalities and actions tend to push our buttons the most are generally our greatest teachers. 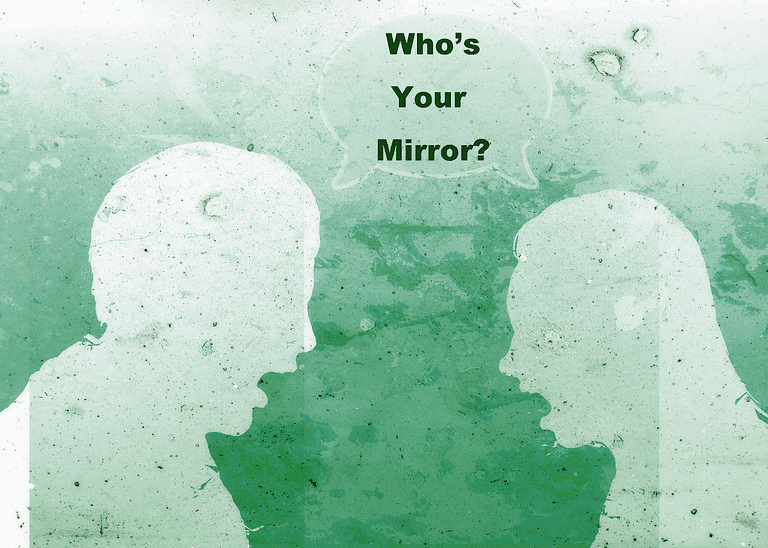 These individuals serve as our mirrors and teach us what needs to be revealed about ourselves. Seeing what we don't like in others helps us look deeper inside ourselves for similar traits and challenges that need healing, balancing, or changing. When someone is first asked to understand that an irritating person is merely offering him a mirror image of himself, he will strongly resist this idea. Rather, he will argue that he is not the angry, violent, depressed, guilt-ridden, critical, or complainer person that his mirror/teacher is reflecting. The problem lies with the other person, right? Wrong, not even by a long shot. It would be convenient if we could always place the blame on the other person, but this is not always so easy. First, ask yourself, "If the problem truly is the other fellow's and not my own then why does being around that person affect me so negatively?" Our shortcomings: Because character flaws, weaknesses, etc. are more easily seen in others than in ourselves our mirrors help us to be able to see our shortcomings more clearly. Magnified pictures: Mirroring is often magnified to enhance getting our attention. What we see is enhanced to look larger than life so we won't overlook the message, making sure we get the BIG PICTURE. For example: Although you are not even close to being the overbearing critical type of character that your mirror is reflecting, seeing this behavior in your mirror will help you see how your nit-picking habits are not serving you. Repressed emotions: Our mirrors will often reflect the emotions that we have comfortably repressed over time. Seeing someone else display unleashed similar emotions may very well touch on our stuffed feelings to help bring them to the surface for balancing/healing. Our family, friends, and coworkers don't recognize the mirroring roles they are acting out for us at a conscious level. Nonetheless, it is no coincidence that we are conjoined within our family units and our relationships to learn from one another. Our family members (parents, children, siblings) often play major roles of mirroring for us. This is because it is more difficult for us to run and hide from them. Besides, avoiding our mirrors is nonproductive because, sooner or later, a bigger mirror will appear to present, perhaps in a different way, exactly what you are trying to avoid. Ultimately, by avoiding a particular person we hope that our lives will be less stressful, but it doesn't necessarily work out that way. Why do you suppose some people tend to attract partners with similar issues (alcoholics, abusers, cheaters, etc.) repeatedly? If we succeed at getting away from a person without learning what we need to know from the relationship we can expect to meet up with another person who will very soon reflect the same image upon us. Ahhh... now a second opportunity will surface for us to take inventory of our issues. And if not then, a third, and so forth until we get the BIG picture and begin the process of change/acceptance. When we are confronted with a personality that we find bothersome or uncomfortable to be around it can be a challenge to comprehend that it is offering us a grand opportunity to learn about ourselves. By shifting our perspectives and attempting to understand what our teachers are showing us in their mirror reflections we can begin to take baby steps toward accepting or healing those wounded and fragmented parts within ourselves. As we learn what we need to do and adjust our lives accordingly, our mirrors will change. People will come and go from our lives, as we will always attract new mirror images for us to look at as we progress. We also serve as mirrors for others without consciously realizing it. We are both students and teachers in this life. Knowing this might make you wonder what types of lessons you are offering others by your actions each day. But that is the flip side of the mirroring concept. For now, focus on your own reflections and what the people in your current circumstances are trying to teach you.